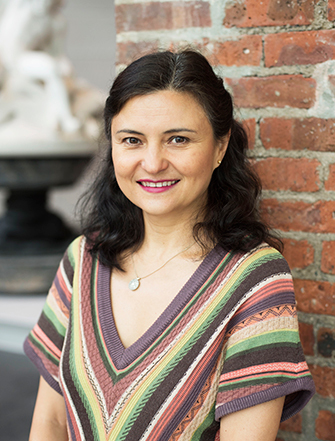 Ayşin Yoltar-Yıldırım comes to the Brooklyn Museum from the Harvard Art Museums, where she was the Assistant Curator of Islamic and Later Indian Art since 2013. At Harvard she worked toward the reinstallation of the new Islamic and Later Indian Art galleries, which opened in 2014, and curated the recent exhibition A New Light on Bernard Berenson: Persian Paintings from Villa I Tatti. She is also the editor of an upcoming book on the same subject, which will be published by Villa I Tatti. Yoltar-Yıldırım received her M.A. and Ph.D. in Art History from the Institute of Fine Arts, New York University. Earlier in her career she was a Fellow and Research Assistant at the Metropolitan Museum of Art and conducted extensive research on a variety of subjects through several fellowships and grants. Yoltar-Yıldırım has taught courses on the history of Islamic art in both the United States and her native Turkey. She is the author of a handbook on Ottoman decorative arts as well as several articles on the arts of the book and the history of Islamic collections.